Pet Wellness…how old is my pet, really? Many pet parents are surprised to learn that pets age at a much faster rate than people. In fact, the average dog is middle-aged by the age of four years old. Then, for every 6 months that go by on the calendar, that same dog ages the equivalent of 3.5 years. A lot can change in that space of time! This is why many illnesses can sneak up on a pet before we’re ready to expect them. 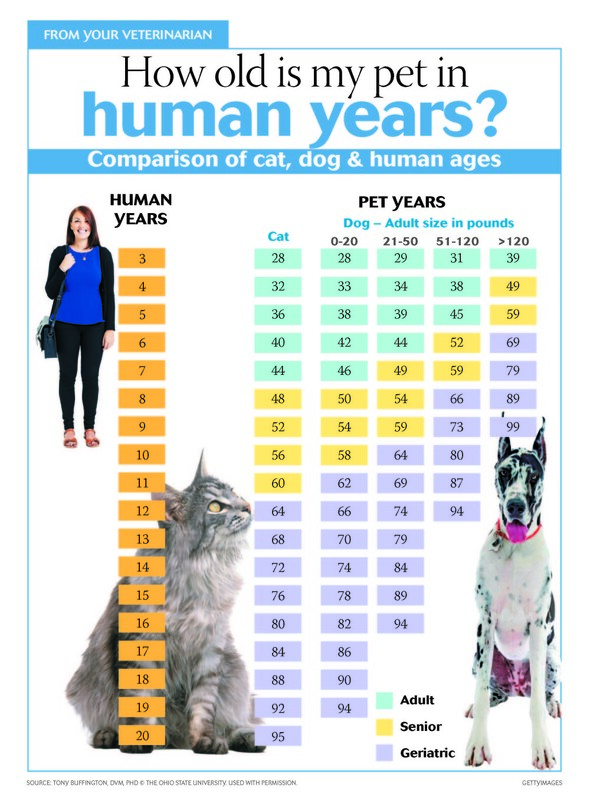 Check out the chart below to see how your pet’s age stacks up in “people” years. An inexpensive Wellness Exam when your pet is young gives us a baseline from which to measure any future changes. Regular visits also help us develop a bond with your pet…and with you. Your visit to our hospital for a Wellness Exam will first include a consultation so that you can report anything new or different. Come prepared to talk about your pet’s habits, preferences, and lifestyle. We’ll decide together what immunizations and other preventives your pet may or may not need. Next we’ll conduct a physical exam, checking your pet’s major systems like its heart, lungs, eyes, skin, teeth, ears, back, abdomen, and joints, and that’s only part of the list. Unlike the rest of the family, your pet can’t tell us when they are beginning to feel ill and a Wellness Exam can reveal problems you may not have been aware of. When your pet gets regular Wellness Exams over the course of its lifetime, it helps us catch little problems before they become big problems. This helps you and your pet get to spend a lot longer happy and healthy time together!